DVD Flick is probably the best free DVD authoring program for Windows. However, there is no Mac version of DVD Flick. Don't get confused. The DVD Flick for Mac talked here is an alternative to DVD Flick that works well on Mac. Aimersoft Best DVD Burner Mac is highly recommended as the DVD Flick for Mac. It has many features similar to DVD Flick: support for various video formats, customizable DVD menu templates, built-in video editor, etc. And it's even much better than DVD Flick for its intuitive interface, fast burning speed, high video quality, etc. Now just download this DVD Flick for Mac alternative and follow the guide below to convert your video files to DVD with ease. You can either click the "+" button to select and import files to this program or directly drag and drop the video you want to burn to the source pane. Supported video formats include AVI, WMV, MOV, MP4, MKV, FLV, ASF, M2TS, etc. You can add photos to make a photo DVD slideshow. 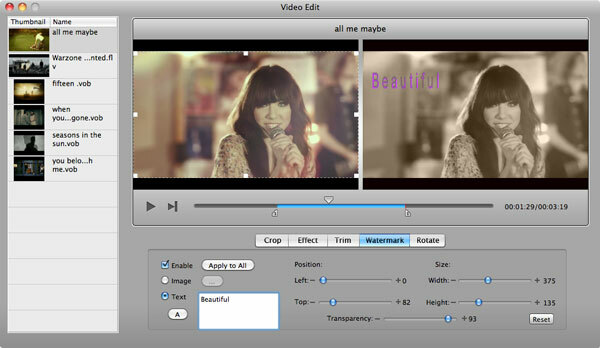 Video editing functions like crop, trim, rotate, adjust video effects, add watermarks, etc. are provided. To do so, you can simply select a video clip and click "Edit" to open the "Video Edit" window. This DVD Flick for Mac provided over 90 free dynamic and static DVD menu templates. And it's very easy to customize the DVD menu with your favorite images, music, frames, buttons, etc. If you don't want to apply a DVD menu, simple choose "No Menu". Next, click "Preview" to have a look at the entire DVD movie and make sure it's what you want. Then insert a DVD disc into your Mac's hard drive and click "Burn" on the main interface to open the "Burn" window, where you can set the burning parameters. 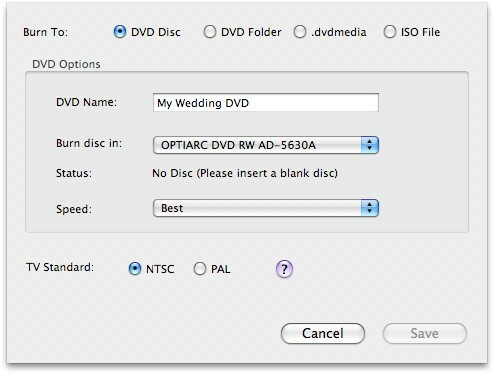 Finally, click "Save" to begin burning your video to DVD with this Mac DVD Flick alternative.